Welcome to the 100th post here on The Cilantropist! Over the last year this blog has grown and developed, and I am relishing in every moment of it. I can barely believe that I have shared 100 posts with you! I am committed to bringing you fresh, seasonal, and delicious food (plus cakes and cookies, we can't forget those!) and I do my best to only share things that I think are excellent. Compared to when I first started, The Cilantropist is so much more like what I dreamed it would be, and it is still evolving. Keep your eyes peeled for a few changes and additions in the weeks and months to come, but be assured that you will still always be able to find great food over at this corner of the web. I also want to give a big shout out to YOU! Each and every one of my readers, please know that I love love love having you here and it means the world to me knowing that you appreciate food, family, and friends. I also adore your comments and emails - they make me smile and laugh, and they brighten my day each time I read one. (And I read all of them!) I truly appreciate that you share my blog and recipes with family and friends, since feeling connected to people is really at the heart of my cooking. I hope you will continue to follow along with me as I create another 100 recipes and share stories from my adventures in the kitchen. I can also say that over the last year my passion for food and cooking has increased exponentially, and everything about it brings me so much happiness. I am more conscious of what I eat now, and more committed than ever to eating sustainably and locally, and working more towards living a hand-crafted life. This doesn't mean eating only organic or natural foods - that is just not realistic for me right now - but it does mean shopping at the farmers market as often as possible and making dishes from quality well-sourced ingredients. Very simply, I think it is a healthier way to live and eat. So I thought, for this 100th post, that I should share one of my favorite dishes with you since I can source all the raw ingredients from my farmers market. 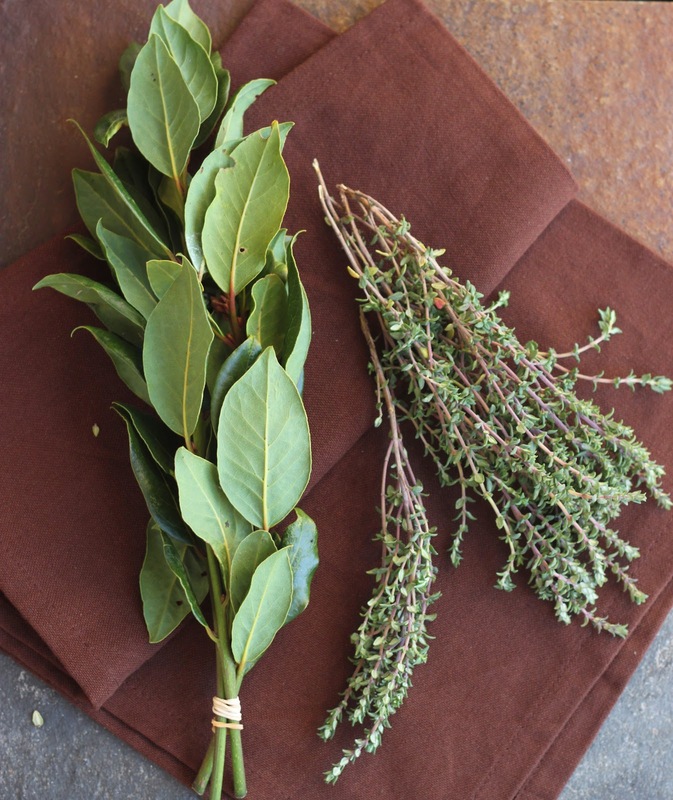 Are you able to find fresh bay leaves? I think they are just beautiful. This classic dish of Mussels with Shallots and Thyme has its roots in traditional French cooking since it uses a broth made with cream, wine, shallots and herbs, to steam open fresh mussels. I made this dish for the first time almost four years ago, when my boyfriend and I discovered we could get fresh Carlsbad mussels at the farmers market near my apartment. Nowadays, I can get everything else I need to make it from the farmers market as well, including fragrant thyme and beautiful green bay leaves. 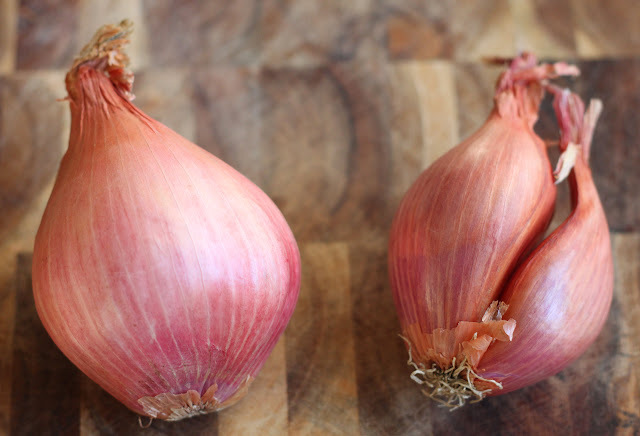 I can also find big, beautiful shallots at my farmers market that are incredibly different than the ones you can find at the grocery store. They are generally larger (which is not true with all farm-grown items, oftentimes they are smaller since they aren't genetically modified for mass-production), lighter in color, and they absolutely have a better, fresher taste. In fact, when I cut open the farmers-market shallot and compared it to the grocery-store shallot, the one from the store was dry as a bone. Now, about those mussels... First off, let me say that if you don't like mussels, we just can't be friends. Actually, I am just kidding. (Sort of.) But in all seriousness, try to find the freshest mussels you can for this dish and they will taste fantastic. Depending on if you source them from the store, a market, or a fishmonger, they might still have some dirt/grit/barnacles stuck on them, but they are super easy to clean. Don't buy any mussels that have cracked shells or that don't close if you tap them on a solid surface. 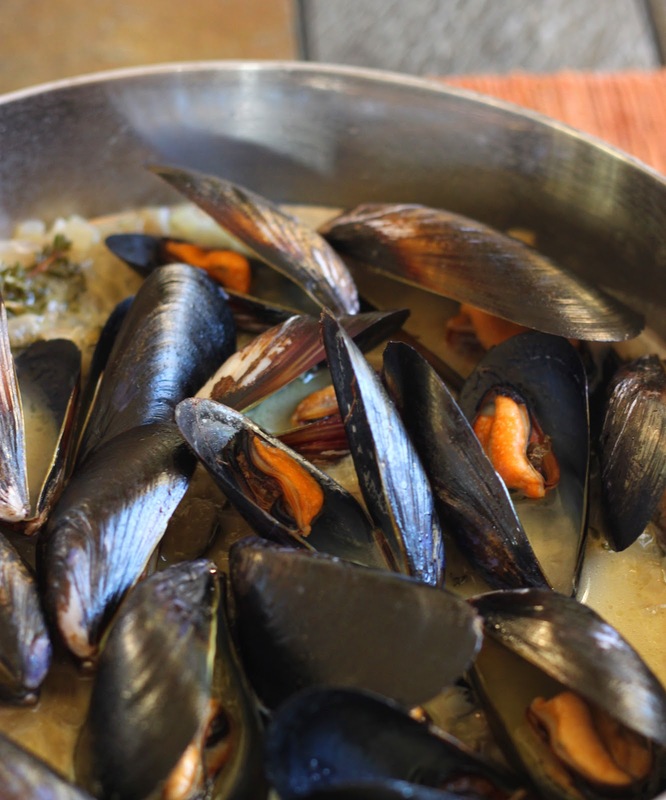 -First of all, use mussels as soon as possible after purchasing them. If you store them in your fridge, don't keep them in a closed container - the best way is to put them in a colander set over a bowl, cover them with a wet dishtowel, and put a few cubes of ice over the top. This keeps them moist and cool. -To clean them, rinse them under cool water, and then locate the 'beard.' This is the hairy part, and it usually sticks out of the flatter side of the mussel. -Once you have pulled out the beard, use a tough brush or the oyster knife to scrape off any remaining barnacles or sea matter. Rinse again and use. Easy as 1- 2 - 3! 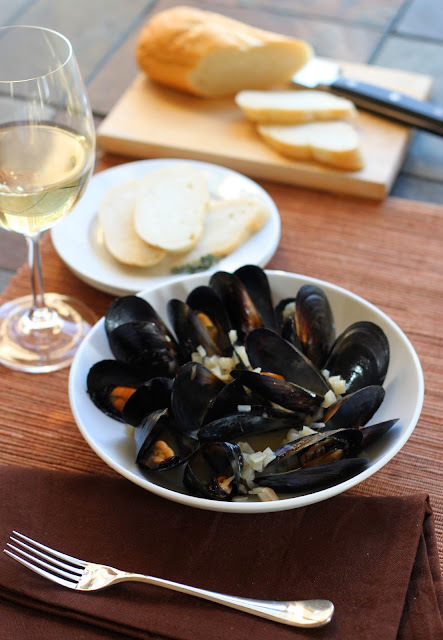 Once you have cleaned your mussels (which with practice only takes about 10-15 minutes) the rest of the dish almost comes together on its own. Saute the shallots, add the wine, cream, and herbs, then reduce the sauce to steam the mussels. And how do you know when the mussels are done? Well that's easy - they open up! Any mussels that don't open are dead so be sure to discard them. This meal is so simple and elegant, and when it is served with a glass of dry white wine, some crusty bread, and a nice green salad, it is absolute perfection. 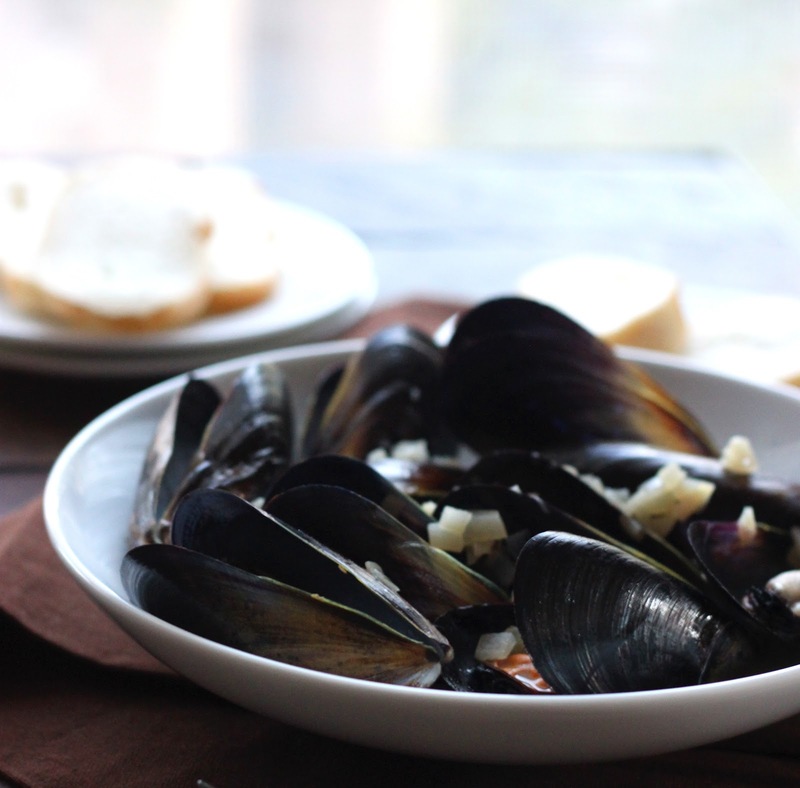 Whenever I make this with my boyfriend, we pick up the mussels on a Saturday afternoon and enjoy them as the sun sets for a relaxing weekend meal. I honestly can't imagine having it any other way. However, these mussels are also the perfect type of dish to serve for a small dinner party with friends. 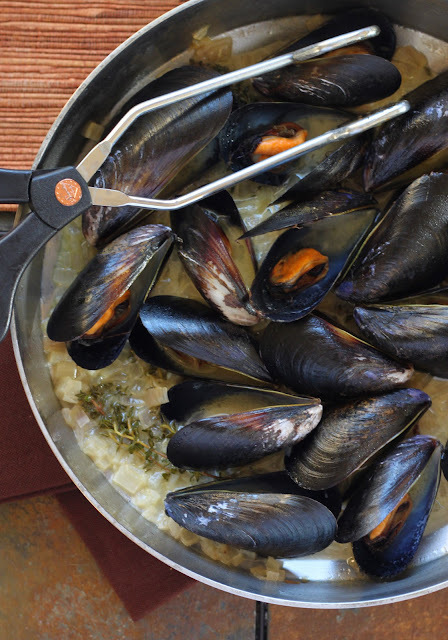 I can promise that when you bring a skillet to the table with perfectly steamed mussels, your guests will be totally impressed and will declare you a master chef. 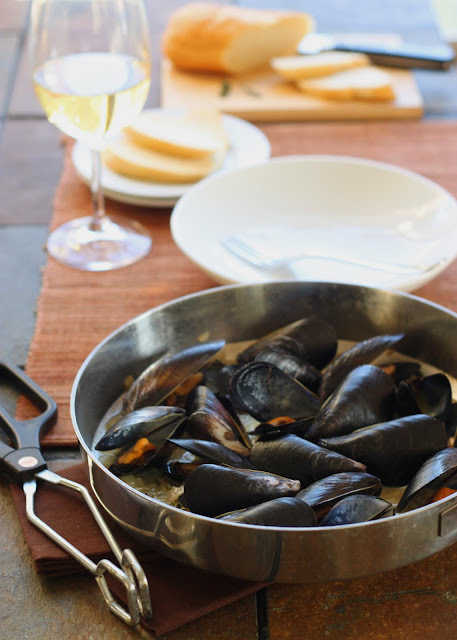 You can serve everything family-style, by passing around sliced french bread and serving the mussels directly from the skillet. But whenever you serve this dish, just be sure to put your feet up, pour yourself a glass of wine... and definitely do not forget the crusty bread. 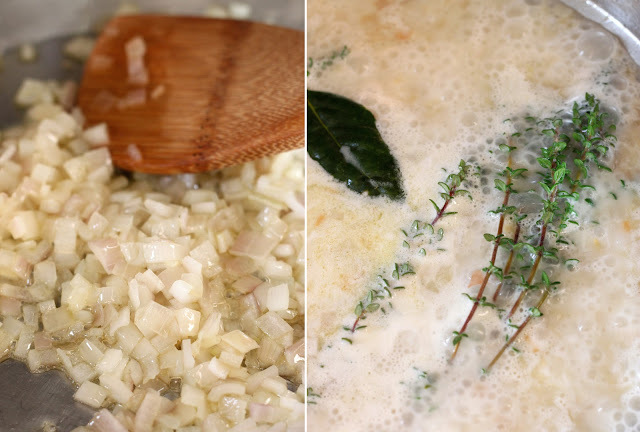 You will want to soak up every last drop of this broth, and eat every last tiny shallot. For me, it is hard to decide what I like better - the mussels, or eating the broth. Actually, when I really think about, I think the thing I like the best is knowing the whole meal is sourced locally. It just somehow makes everything taste better. I prefer the recipe made with mussels, but it is also great made with baby clams. If you want to add a little color to the dish, you can throw in some diced tomatoes while the sauce is reducing. Also, if you don't have/can't find clam juice, the broth will still be good if you sub it for another cup of wine - but do your best to find the clam juice because it gives the broth so much more complexity. 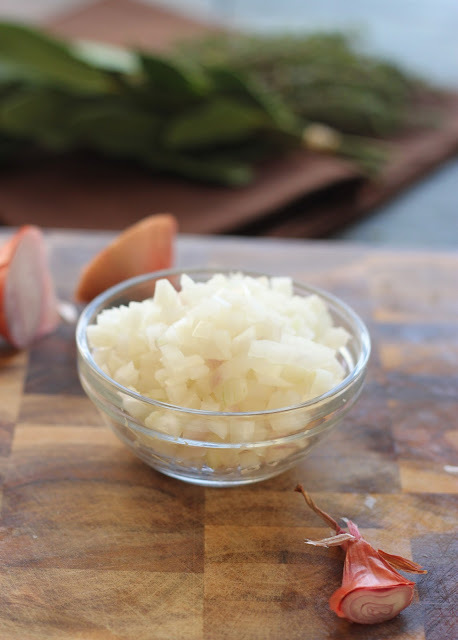 In a large heavy-bottomed skillet, heat oil over medium heat, then add shallots and saute for about 7-10 minutes or until softened. Add the remaining ingredients except for the mussels, stir to mix, then bring to a boil over high heat. Reduce heat to medium-low and reduce sauce until it is about 1 cup (about 8 minutes). Add the mussels, cover, and steam until the mussels have opened, about 7 minutes. Discard any mussels that do not open. Use tongs or a slotted spoon to transfer mussels to bowls to serve, and ladle sauce over the top. Serve immediately, with plenty of slices of sliced crusty french bread. Happy 100! Looks like a wonderful celebratory meal. I've never prepared mussels at home but how I am sorely tempted. Mmmm...can I pop over for dinner next time these are on the menu??? Congrats on your 100th post..you have such a beautiful blog. Congratulations on your 100th post, what a great day!! 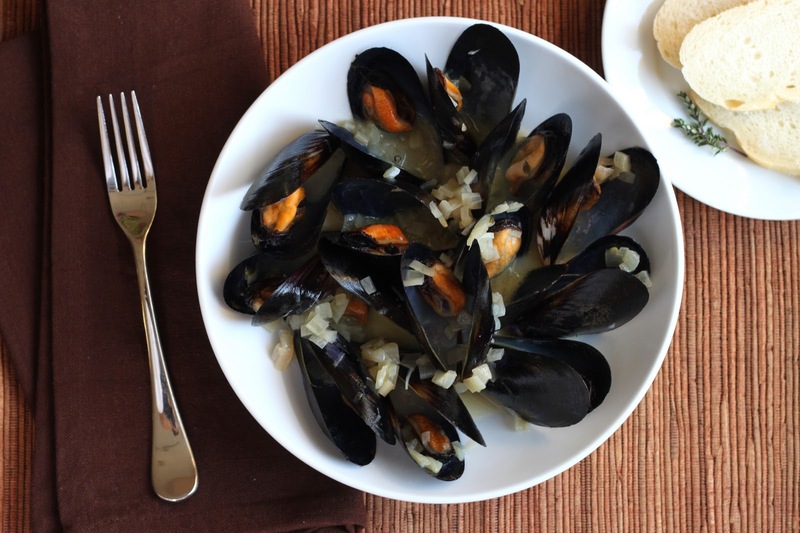 Mussels are high on our list of foods to eat, yours look wonderful prepared with those lovely shallots! Congratulations! The aroma on this - I can almost smell it, looks so good. Lovely dish and beautiful vibrant pictures.... ! Congratulations on your 100th post, A perfect post ....!!! Here's to more blogging, more writing, and more food! Congratulations on your 100th post, Amanda! What a fine accomplishment. Here's to more blogging and more eating!! Mussels are my absolute favorite thing to order at a restaurant. 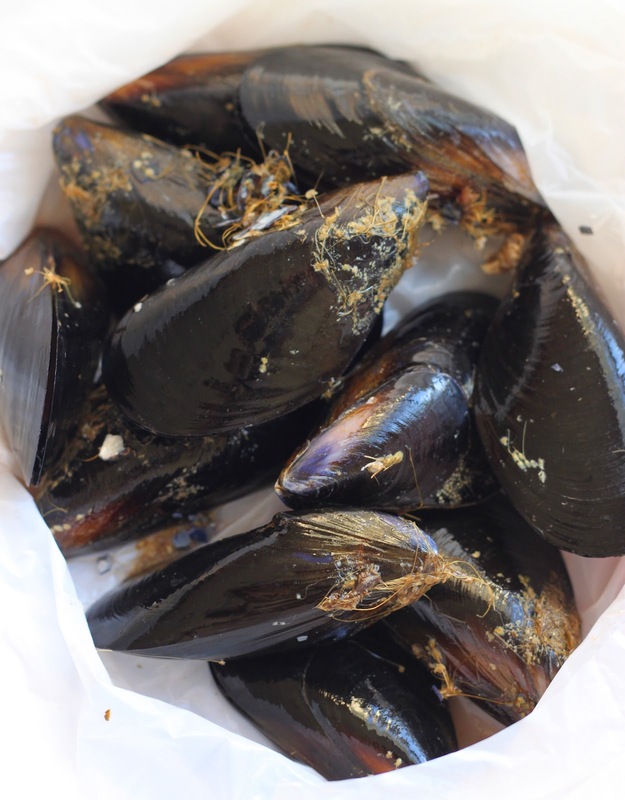 You are making me want them now, but I'm not sure I can get good quality mussels in southwestern Ohio! GORGEOUS! I love mussels (although I hate removing the beard!) and these look wonderful. Congrats on your 100th post! Here's to many more! 100 posts! How wonderful! Glad to help you celebrate. You have a wonderful blog . . . and this post is a great way to celebrate. I understand what you mean about blogging helping you grow . . . I used to think I was a pretty good cook. But I've learned so much from blogging, from creative people like you. I never thought of trying mussels at home; you've emboldened me! Happy 100th post Amanda! Now this is a great way to celebrate! I'm looking forward your next 10000000000....th posts! In the meantime, I will enjoy your (as usual) wonderful wonderful pictures. Congrats on your 100th post! And what a post it is! Mmmmmmmmm! The shallots and butter and those beautiful, beautiful mussels! DIVINE! Congrats on your 100th post! That's fantastic. P.S. I just noticed that you're a research scientist - and guess what? So am I!!! Small world. Congratulations on your 100th post!! And absolutely BEAUTIFUL mussels! My mouth is watering for them! Congrats on your 1ooth post! 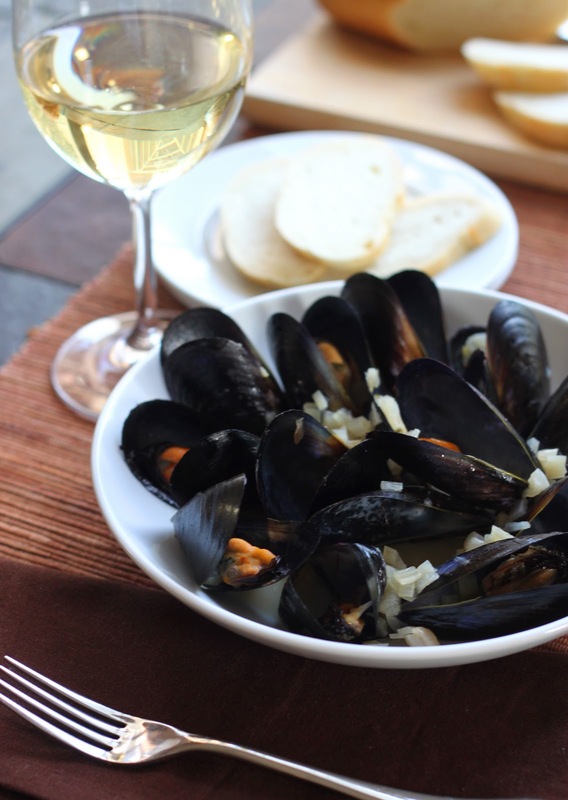 I always love ordering mussels in restaurants, but I've never made them myself - yours look awesome though, so maybe I'll try it soon!